Vietnam has become an appealing investment destination for international textile and garment enterprises, as Vietnam’s apparel sector is expected to continue to register strong growth in the coming years. 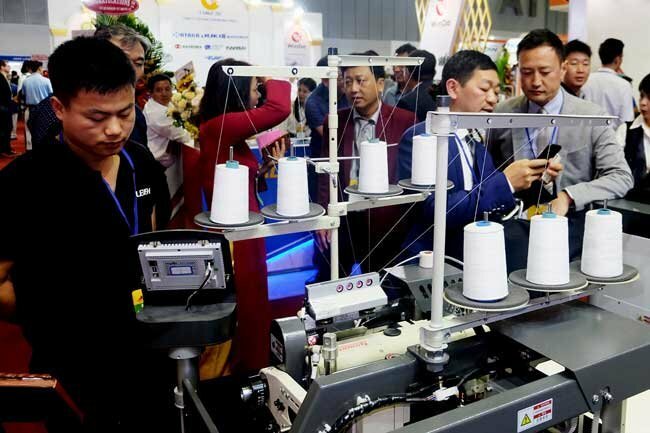 Specifically, more than 1,000 suppliers from 24 countries and territories, including China, France, Germany, Japan, Singapore, the United Kingdom and Thailand, are participating in the 2019 Saigon Tex and Saigon Fabric exhibitions, the two events in the textile and garment industry held concurrently at the Saigon Exhibition and Convention Center in HCMC’s District 7 from April 10 to 13. There are 100 more exhibitors this year, than in 2018. Most of them agreed that Vietnam, a leading exporter of textiles and garments, is a promising market for suppliers of apparel materials and equipment. According to data from the General Statistics Office, Vietnam exported US$7.3 billion worth of textiles and garments to other countries in the first quarter of this year, up 13.3% year-on-year. The United States was Vietnam’s largest importer of textiles. Meanwhile, a leader of Vietnam National Textile and Garment Group (Vinatex) said 2018 was a breakthrough year for the local textile-garment sector, with export revenues of more than US$36 billion, the highest since 2015. The sector is forecast to grow further in the coming time, as Vietnam has signed multiple free trade agreements. Therefore, the sector set a target of US$38-40 billion in export revenue for this year. Marisa S. Kuo, project manager of the Taiwan Textile Federation’s Overseas Development Department, said its members have taken part in Saigon Tex and Saigon Fabric for five consecutive times. This year, 30 member enterprises of the federation are introducing their products and equipment at 50 booths. These enterprises are interested in investment opportunities in Vietnam, due to its low production and labor costs and opportunities from FTAs, Kuo added. Half of Taiwanese enterprises participating in the two expos have had factories in Vietnam and have plans to expand their operations in the country. Additionally, many Taiwanese textile and garment firms in China intend to move their production lines to Vietnam. In recent years, Vietnam’s textile and garment sector has reported impressive achievements. However, the global market has set increasingly strict requirements, requiring local firms to improve the quality of its products.